This week was hill week and a good training week it has been. A brisk fartlek on Monday, Tuesday was a mega session of Hill Reps which left me walking like John Wayne for the rest of the week. My poor adductors are still complaining. Wednesday was a hilly wee run. Thursday was a brutal tempo run. Saturday was 11 hilly miles and Sunday was 19 miles along the Union Canal with every kind of weather the irascible Scottish climate could think of to throw at us. 50 miles for the week so the mileage is creeping up nicely. Highlight of the week was a Saturday run into the Ochils in the snow on a clear sunny day. Dumyat is the nearest hill to our house. It is a distinctive peak at the west end of the Ochil Hills above Menstrie. I have a nice 10 mile (ish) circuit which starts in Menstrie, climbs up through Menstrie Glen for a few steep miles, on to Sheriffmuir, then along the road to Dumyat, Up Dumyat, Back down the other side to Menstrie Glen once more and back down to Menstrie. It is good running on rough farm tracks. It is a really good workout with more than 2000 feet of climb and some mixed terrain to keep it interesting. Despite the fact that snow had started to melt at ground level, by the time we were 300 feet into the hills there was soft powder snow a-plenty. Some of the drifts were very deep and the fresh snow meant we were running on unbroken paths for much of the way. There had been one runner on the hill before us though – you could tell this by the very distinctive tread pattern of a pair of Inov-8 roclites! There was running, walking, skipping, jumping, sliding, sinking, shuffling all in the one day. In places the snow was easily 3 feet deep and completely virgin. It was a hard run on tired legs but great practice in lifting your feet and a good workout for all the stabiliser muscles which dont get used on the roads. Dumyat itself was busy with walkers. 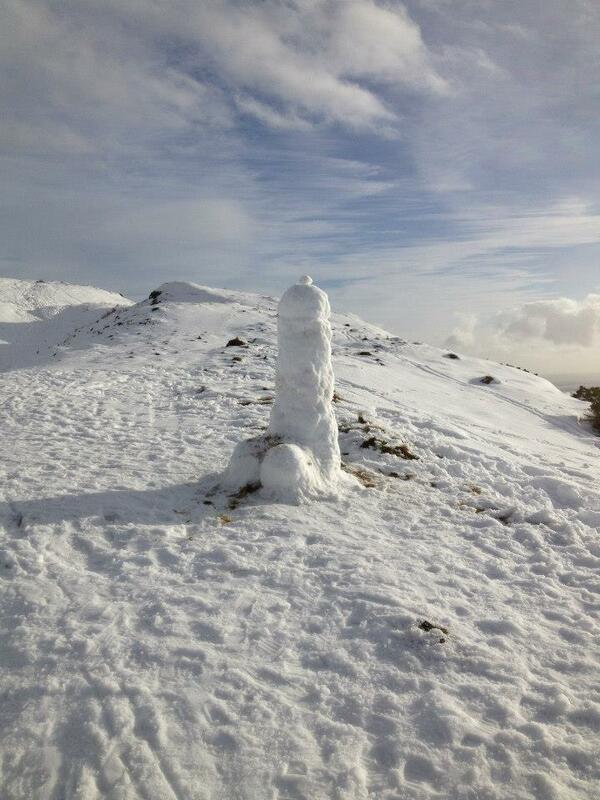 Some wag had even made a snowman. I suspect more than one parent told their offspring it was a statue of the Wallace Monument. It was one of those days which dont come around very often when the conditions are perfect and you get to experience something very special. I don’t know if this might be considered a bit elitist, but for me it is one of the reasons I run, that you get experiences which can’t be bought, experiences which have to be earned through the sweat on your brow, that you can’t get watching tv or on your computer. It is the pain and the elation which reminds you that you are alive, getting to places you can only get to on foot. If you aren’t prepared to put in the work to run up that hill, you will never experience the view from the top. And from the top you get a perspective which allows you to see the big picture.